TechPinas is a #PartnerForChange of the Duterte Administration -- and as such, we will be regularly posting updates and articles about the programs and projects of the government (especially those that are related to technology) as well as speeches and appearances of our President that will be broadcast via social media. 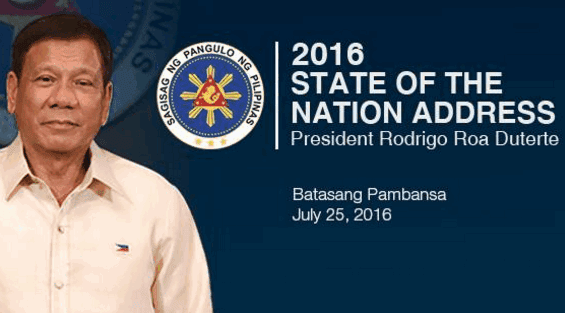 Today - July 25, 2016 - at Batasang Pambansa in Quezon City, his excellency President Rodrigo Roa Duterte will be giving his first State of the Nation Address in front of the country's lawmakers, leaders, and other distinguished guests. Pangulong Digong is expected to talk about the accomplishments of his administration since he took office in June 30, 2016 as well as his plans for governance moving forward. Some of the topics that he is expected to cover in his speech include his administration's fight against crime and corruption, legislative agenda, campaign against drugs, economic programs, his stance on our claim versus China on the disputed territories in the West Philippine Sea, and the government's solution to the current transportation crisis.